A paper under open review for Climate of the Past reconstructs summer [June, July, August [JJA]] temperatures in Sweden and Finland over the past ~2,200 years and finds temperatures during the Medieval Warm Period 1,000 years ago and the Roman Warm Period 2,000 years ago were about the same as at the end of the 20th century. The paper also shows excellent agreement between the instrumental record since 1800 and the proxy reconstruction, unlike Michael Mann's hockey stick "trick to hide the decline" in proxy temperatures after 1960. 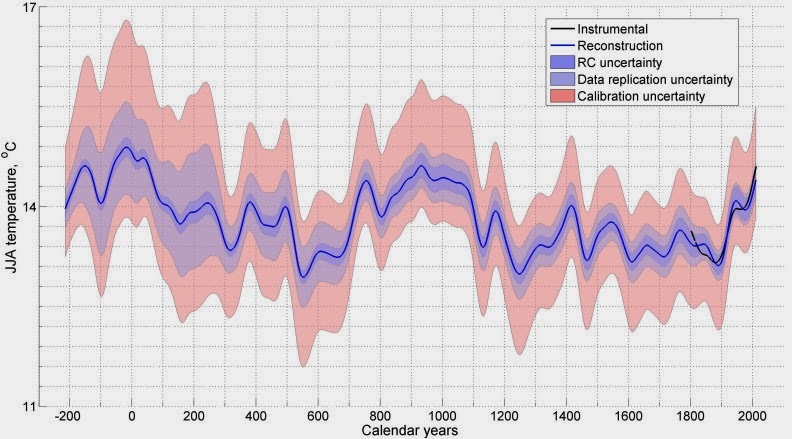 The paper adds to the published papers of over 1,200 scientists finding non-hockey sticks demonstrating that the Medieval Warm Period was global and as warm or warmer than the present. Fig. 8. Reconstruction of June, July, August [JJA] temperatures with 95% uncertainty levels. Temperatures during the Medieval Warm Period 1,000 years ago and the Roman Warm Period 2,000 years ago were the about same as at the end of the 20th century. Instrumental data from 1800 shown by black line. Abstract. Here we analysed the maximum latewood density (MXD) chronologies of two published tree-ring datasets: from Torneträsk region in northernmost Sweden (TORN, Melvin et al., 2013) and from northern Fennoscandia (FENN, Esper et al., 2012). We paid particular attention to the MXD low-frequency variations to reconstruct long-term summer (June–August, JJA) temperature history. We used published methods of tree-ring standardization: regional curve (RC) standardization, combined with signal-free (SF) implementation. Comparisons with a single-RC (RC1) and multiple-RC (RC2) were also carried out. We develop a novel method of standardization, the correction (C) implementation to SF (hence, RC1SFC or RC2SFC), tailored for detection of pure low-frequency signal in tree-ring chronologies. In this method, the error in RC1SF (or RC2SF) chronology, is analytically assessed and extracted to produce a RC1SFC or RC2SFC chronology. In TORN, the RC1SF chronology shows higher correlation with summer temperature (JJA) than RC1SFC, whereas in FENN the temperature signals of RC1SF chronology is improved by correction implementation (RC1SFC). The highest correlation between differently standardized chronologies for two datasets is obtained using FENN-RC2SFC and TORN-RC1 chronologies. Focusing on lowest frequencies, the importance of correction becomes obvious as the chronologies become progressively more correlative with RC1SFC and RC2SFC implementations. Subsampling the FENN data (which presents a higher number of samples than TORN dataset) to the chronology sample size of TORN data shows that the chronologies consistently bifurcate during the 7th, 9th, 17th and 20th centuries. We used the two MXD datasets to reconstruct summer temperature variations over the period −48–2010 calendar years. 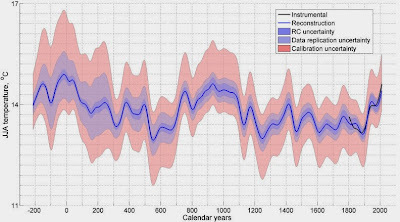 Our new reconstruction shows multi-decadal to multi-centennial variability with changes in the amplitude of the summer temperature of 2.6 °C in average during the Common Era.